That time of year again when hits can be garnered from repeating helpful information that people should have got from elsewhere, but didn’t. This year’s State of the Nation Address (SONA) is on Thursday, but the rehearsals begin this evening, disrupting your drive home and reminding you of the pomp our President so richly deserves. First off is the DA, starting at Gardens Centre Woolies Mill Street at 9am. Then Ses’Khona (minus currently jailed poo-flinger Andile Lili) from Kaizersgracht at 10. Later (1pm) is the #ZMF movement, heading from Greenmarket Square down to the Grand Parade. 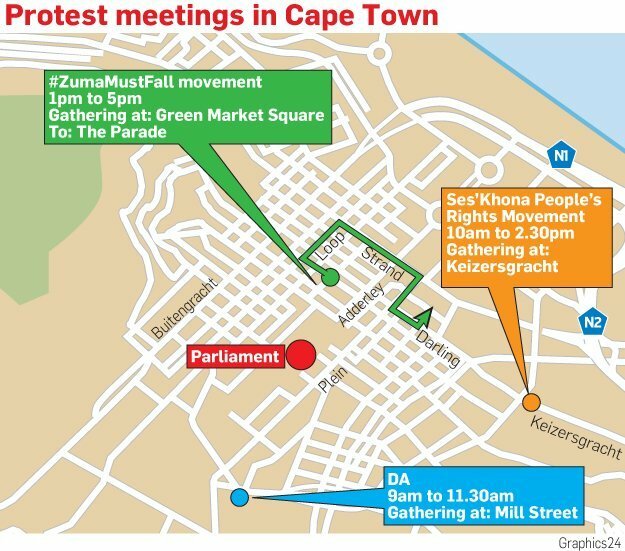 For the record, the #ZumaMustFall group has applied for 5000 marchers, Ses’Khona has applied for 1500 marchers, and the DA has applied for 500. Look, the smart thing to do is to avoid the CBD altogether on Thursday. But if you really can’t, then plan carefully and pack adequate supplies for a night in your car.